Taste test: With white cheddar popcorn having the most momentum in the cheese-flavored popcorn arena these days, I was surprised to find myself craving the orange-cheese popcorn while on a recent trip to Washington, D.C. I found this bag of Herr's Cheese Popcorn, and was surprised that we hadn't reviewed it yet. I remember as a kid loving the orange-cheese popcorn, although it was from a different brand. I eagerly bought the bag, hoping to re-kindle the memories I had as a youngster devouring the bag of popped corn. No such luck here. The popcorn itself was OK  fresh and crunchy  but the cheese powder on the popcorn was not to my liking. It was almost too strong a taste, and it certainly didn't remind me of the cheese popcorn I ate as a kid. I'll stick with the white cheddar popcorn for the time-being. Smell test: Smells like popcorn, nothing too cheesy to the smell. 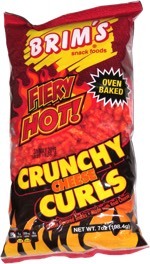 This snack was discovered by Keith at Crystal City Shops, Washington, D.C.. Review published .